Click the gear icon at the top right of your Genbook account screen to access Settings. At the very top of the page, you'll see (and be able to edit) your business's Scheduling Webpage URL. (That's the address where your customers will find your Genbook scheduling site.) You can copy and paste it into your email signatures, text it to customers, share it on Social Media, and more. You can also create a test appointment to see exactly what your customers would see when they book. Your Business Profile section is where you'll find and edit the basic details of your account. This is where you can add and manage your staff and services, add your business's unique logo to your scheduling page, set your operating hours and ensure your address and contact information are correct. This is also where you can set the search categories under which your business appears on the Genbook app. 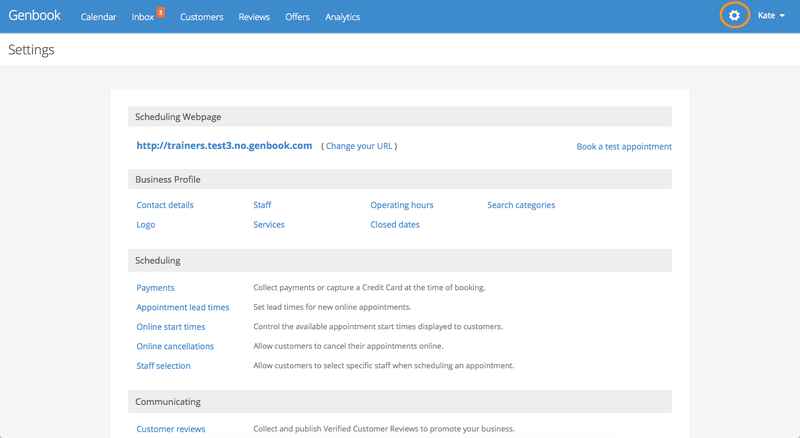 Next up is the Scheduling section, where you will set parameters and rules for your clients' online booking experience. The Payments feature lets you collect full payments, deposits or just credit card details at the time of booking. Appointment Lead Times indicate how far in advance a client can see availability and book. Online Start Times determine the exact times or increments at which appointments are offered. You can specify your cancellation policy and cutoff under Online Cancellations. Staff Selection lets you choose whether to display staff names, a "no preference" option or both options to clients scheduling online. 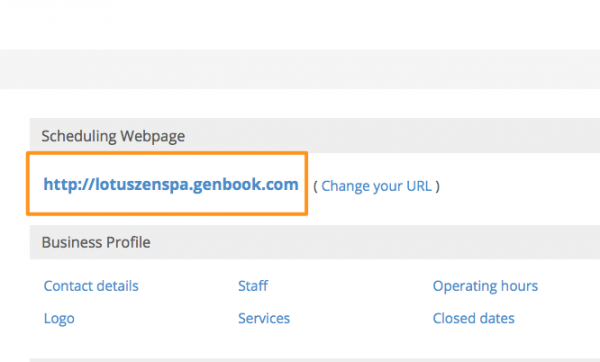 In the Communicating section, you will be able to customize which emails and texts Genbook sends your clients on your behalf, as well as how you're notified of new online bookings. Choose how often you wish to collect reviews, how far in advance of an appointment clients receive a reminder via email and/or text, and add up to three general messages and one file attachment to all confirmation emails. You'll also be able to ask a question that you'd like customers to answer when they book, using the "Additional requests" feature. Finally, the features under Connecting are all about spreading the word about your scheduling page and reviews. Here you'll find instructions for adding booking buttons and links on your website and Facebook, and posting a "Read my reviews" button on your website. You can also invite clients to make appointments from this section.